Nations Press feature news Photo of this crying Father Goes Viral again-Find out why! Photo of this crying Father Goes Viral again-Find out why! SPONSORED LINKS John Carlo or Jace to family and friends graduated from Philippine Normal University-Manila with Bachelor of Science in Mathematics for Teachers degree. Siya po ang TATAY ko. Kargador po siya sa palengke, pero dakilang ama yan at mabuting kaibigan. Umiiyak siya sa picture na yan oh. Kasi inabot ko sa kanya yung pinagpaguran niya. Yung mga medalyang nararapat lamang na siya ang magsuot. Yan kasi yung pinaghirapan ko na marapat lang na ipagpasalamat ko sa kanya. May sakit pa siya nyan, pero hindi nya hinayaang hindi makapunta sa graduation ko. Kasi alam niyo ba, sobrang saya niya ng malaman niyang valedictorian yung anak niya. Lagi niyang pinagmamayabang yung nakuha ko, at lagi niyang pinagmamalaki ang pangalan ko. Masasabi ko na ngang, siya ang number one fan ko. Kaso wala na siya eh. Since then his story had been featured on different shows, including Korina Sanchez’s ‘Rated K’ which was aired Sunday night, July 3. He even posted a thank-you video about it. “Everything started with a simple post. Which suddenly reached a lot of people worldwide, and it brought me to various interviews in different forms of media: facebook page, blogs, newspapers, youtube, radio station and television”; Jace said in his Facebook post. It can be recalled that around August last year, Jace posted a photo of his father. However, it was not the photo that captured the hearts of the people. It was the caption that went along with the photo. Jace paid a tribute his father dad Carlito Pasigay, his superhero, who passed away two years before he posted the throwback photo. Jace graduated as the class valedictorian. His father worked as a porter. During the day of his graduation, his father made sure to be present despite his sickness. 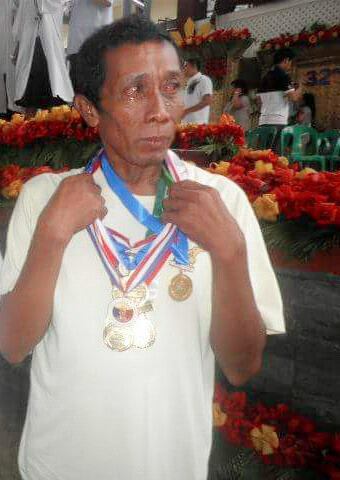 The photo shows the father with tears of joy wearing the medals his son has earned. Jace’s father died at the age of 53 years old. He was not there when Jace earned the degree. However, for Jace, his father’s memory was enough to inspire and motivate him to be the best version of himself.